"Everybody knows there is money to be made from the cloud, but nobody knows how." This week's cover story on Business World details opportunities in Cloud Computing and how a few Indian tech entrepreneurs have grabbed the opportunity to build a viable business in the Cloud. The story explores the S, P and I of the Cloud: SaaS, PaaS and IaaS and details how some Indian entrepreneurs have recognized and harnessed the potential of each segment in their own way to get a quick start and build a business around the same. "Platform-as-a-service is the catalyst for most innovations in SaaS. PaaS refers to an underlying chassis for software development, storage and hosting SaaS over the Internet. It facilitates operations without the cost of buying and configuring the hardware, middleware and software. PaaS has been dominated by players such as Microsoft, Amazon, Google, Wolf Frameworks and Salesforce." "Bangalore-based Wolf Frameworks has another model. It creates platforms for startups to build their own SaaS applications, much like a Microsoft or Google’s, but at an affordable price. “With our platform, small firms can create their own business apps without having to write technical code,” says its CEO Sunny Ghosh. Wolf also offers back up and storage. It has 80 customers that have 55,000 users. It charges on a per-user basis and offers 3 GB storage per head: the peak tariff is Rs 3,088 per month. Wolf has been in the business for six years and has clocked revenues of $1 million. 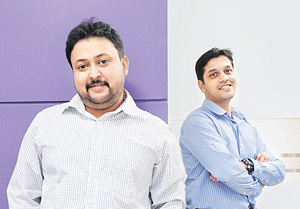 “Our platform gets rid of any IT investment an SME has to make,” says Ghosh." You can read the full story here or rush to your nearest newsstand to grab a copy.